We made our mid-day rounds to check on the animals at 4pm. It was getting dark, but dusk was still a while off. My camera refuses to believe that reality. Though it is only a year old, my camera has great difficulty in filming when the light starts to fade. Photographs, yes. Filming, not so much. This is why the footage I captured appears to be in the dead of night. It isn't. Our chickens put themselves to roost when the light begins to fade, regardless of the time that is. In the winter months, that is often as early as 4 o'clock. In the summer months, the birds will still be wandering around their yard, scratching for bugs and edibles well past 7 pm. Last night, most of the hens and several of the roosters had flown up into the rafters to settle in for the night. I thought you would enjoy a peek into the coop to see the noisy affair of them settling in. I attempted to capture the piggies snoring in the hay, but again, my camera refused to work in the dim light of the barn. Turning on a light would have awoken them and ruined the very shot I was attempting to capture. And, once awakened, they would expect a treat, which I did not have with me. So, I settled for snapping a hasty picture, instead. This is how the piggies pass their evening; bellies full and loudly snoring under their mound of hay. Both of them are in there. You can just see a speck of black near the walls. I think that is some part of Ebony showing through. Everyone got an extra helping of hay last night- some for food, some for bedding. With the forecast calling for temperatures with the wind chill factored in to be well below zero, it was necessary. We are supposed to warm up into the 30's by the end of next week. Until then, we are on high alert. Snow, though inconvenient, is not necessarily problematic for the animals. Days and nights on end of frigid temperatures can be deadly. While the temperatures stay brutally low, we will keep the stalls as closed up as we can have them and everyone will get extra food. Additionally, Sean will be on water bucket patrol several times each day. And, I will need to look for eggs more frequently. They freeze, crack open, and become useless, otherwise. I admit, mine is the slightly easier task. The animals attended to this morning, I think it is time to add another log to the wood stove, heat a mug of cocoa, and get on with the work at hand this day. Thanks for stopping in today. We're glad you came. I have witnessed the noisy affair of chickens settling in for the night many times! It is always entertaining. Seems like they'd be able to just find a spot and stay there but that's usually not the case! 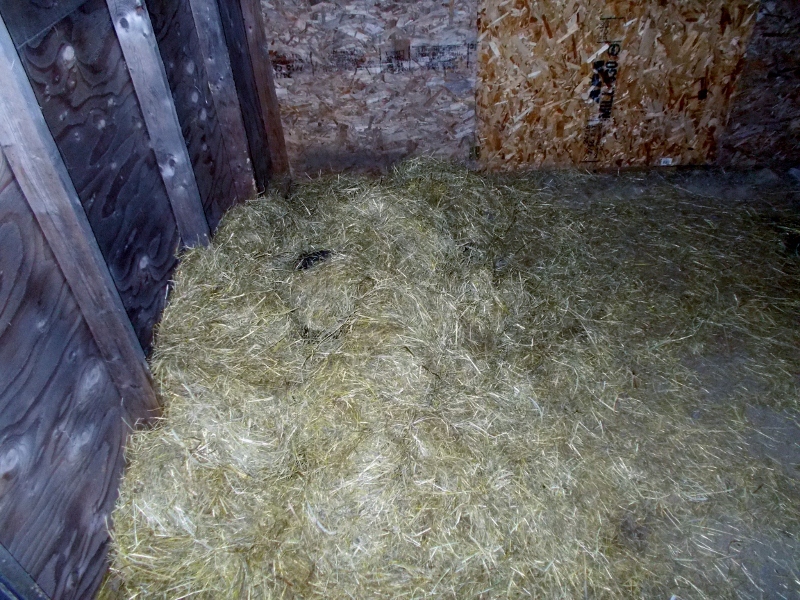 So cute that your pigs sleep under the hay like that! I had no idea that's what they did. It's very smart on their part! And with two of them snuggling together under a blanket of hay, I'm sure they are cozy. I was able to sneak up on the piggies this afternoon during their nap, but was not quick enough to capture it on film, yet! They are very sweet piggies. I thought the man chickens (I know Roosters, but you know how I am) crowed in the morning, do they continue until they go to sleep? They definitely crow to announce the morning. They crow to announce they are hungry, want some lovin', or someone is too close. They crow because they can. They out-crow each other. I like it, but I can understand why they are illegal in some towns and city limits. They are noisy, wee things. My first introduction into the roosting of chickens. They seem like a little family: "Goodnight Grandpa. Goodnight Johnboy." Those roosters want us to think they're in charge. PS I wanted to comment on your care for the animals in the inclement weather. Your concern and diligence come through loud and clear. I would be interested for you to hear from experienced farmers as to what they might do extra for the animals in frigid temps.